We Welcome You to Providence Rhode Island! EVENT LOCATION ADDRESS: University of Rhode Island College of Education and Professional Studies (CEPS) Campus, 80 Washington Street, Providence. ACCESS THE INTERACTIVE MAP HERE. Air Travel. You can fly into Providence (PVD) Green Airport, which is located about 15 minutes south of Providence. Taxi from the airport to downtown is approximately $30. UBER and LYFT faires run $8 - $22. You may also fly into Boston (BOS) Logan Airport. The commuter rail service from the airport to Providence takes 90 minutes and costs $11. From Logan airport, take the Silver Line BUS to South Station, and then take the commuter train to Providence. If you fly into Newark (NY), you can take the Amtrak directly from the airport to Providence for about $50. Train Travel. The Amtrak serves Providence with hourly service to Boston and New York on the Northeast Corridor and Acela. 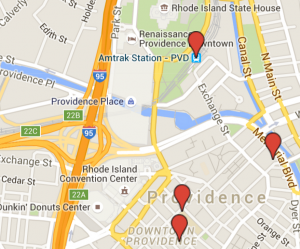 The hotel and conference venue are within a 7-minute walk from the Providence Amtrak train terminal. Lodging Options: Most participants will choose to stay in a hotel, but some will relive their college years by staying in a dorm. You can reserve a room at Hotel Providence, which is located right around the block from the Univeristy of Rhode Island CCE Campus. You can stay in the RISD Dorms. You may also want to rent a private room or even a whole house through AirBNB. The Hotel Providence is located at 139 Mathewson St. Providence, only a 10-minute walk from the Amtrak Train Station. The Hotel Providence is offering participants of the Summer Institute a rate $149/night for a Superior Room. Superior rooms are a mix of one king, two double, and two queen beds. Call the hotel directly at 401.861.8000, and let the reservations agent know you would like to reserve a room under the URI rate code. OR Call Greg Nawrocki, Hotel Providence Sales Manager directly at 401.490.8129. OR go online to www.hotelprovidence.com, entering the dates of stay on the home page, and then select “Promo/Corporate Code” on the next page and enter URI in the drop down menu. Once you click “Update” it will change the rate to the URI rate. Each dorm room is provided with bed and bath linens (2 sheets, 1 blanket, 1 pillow and pillowcase, 2 bath towels and 1 face cloth), which will be provided in a package supplied to each bed. Beds will not be “made up”. 15 West offers Wi-Fi guest service included in the room rate. Also, with the exception of toilet paper, RISD provides no bathroom supplies. No kitchen supplies such as pots, pans, dishware or cutlery are included. Common areas are furnished with soft seating, a TV, and a dining table and chairs. Bedrooms contain an extra-long twin bed, dresser, desk and chair. This is not a hotel: Remember to bring your own soap, shampoo, and personal hygiene products. No parking is provided at the RISD Dorms. We suggest parking at the Dunkin Donuts Convention Center Parking lot.